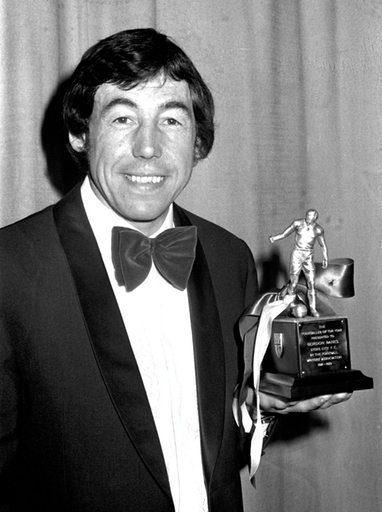 I’ve been lucky to meet many gentlemen footballers - one thinks of the three Bobbies, Moore, Charlton and Robson, Geoff Hurst and Walter Winterbottom - but top of the League of Gentlemen was Gordon Banks. He never changed, friendly, smiling and cheerful despite his handicaps in life. Born in Sheffield, son of an illegal bookmaker, he left school at fifteen and started work delivering coal. His father’s business had collapsed and his handicapped brother died after he was attacked. In 1972 he was in an accident in 1972 when he lost the sight of one eye and his majestic reign as Britain’s finest goalie was brought to an end. I first met him during the World Cup in England in 1966 when he was reaching his best. When he collected his winners’ medal in 1966, he held on to it until he boosted his failing income in 2001 and sold it for £124,750. A cricketing friend named Peter Presence, who ran a company First Features selling sports columns to newspapers all around the world, asked me to approach Gordon and wondered whether if he would be interested. Gordon didn’t have a proper agent and he accepted the modest weekly payment which was slightly higher than his wages as a player. Every week he would ring me on the dot, and as a struggling goalkeeper myself for the Daily Sketch team I learned from a vast amount of tips from him, like standing up when a forward is bearing down on you and not go down too soon. Too much of that still going on today! He preached being calm and the great keepers like Pat Jennings, Lev Yashin, Dino Zoff and David Seaman all had that valuable quality. Joe Hart and Jordan Pickford, in particular, still get over-excited. Over the years I lost contact with him but at the FWA Gala Night at the Savoy I met up with him again in January last year and he was the same but older Gordon. He had kidney cancer and you wouldn’t have guessed it. His great adversary Pele was supposed to be the speaker but exhausted by attending the World Cup draw in Russia he had to withdraw through illness. Gordon was one of the speakers and, inevitably, he talked about his unbelievable save to deny Pele a goal in the 1970 World Cup in Mexico. No football fan will ever forget when The Greatest keeper foiled The Greatest footballer.